There was a period last year when, thanks to a spinach e-coli situation, we could not buy Veggie Booty. 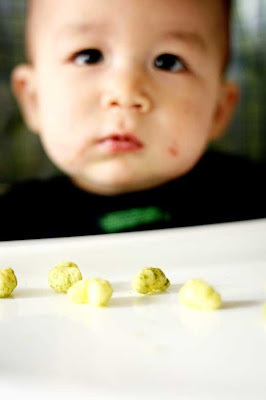 Yes, the little snacks that boasted spinach and kale in bite sized puffs, and were endorsed by my pediatrician (really), were gone from grocery store shelves. It was a tough few months but we made it through and now Thomas has a healthy addiction to cashews and peanut butter and Jelly sandwiches. I am incredibly thankful that Veggie booty was returned to the shelves by the time this little guy was old enough for solids. Sometimes it’s the only thing that keeps Samuel happy while I frantically make dinner – and he inhales them like there’s no tomorrow. So, thank you makers of Veggie booty. You have preserved my sanity on more than one occasion.